The Celtic Cross, which stands in what has become the car park to St. John’s, was erected in 1865 by the widow of William Bingham Baring, 2nd Lord Ashburton, in his memory. It is made from white and red granite on a stone foundation with a red granite plinth. It originally stood at the South East corner of the 1832 church. It is shown, next to the 1832 Church, in the pictures at page 4 of the Pictorial History of the Villages of Northington, Swarraton and Totford. There is a further connection between William Bingham Baring and St John’s. In 1830 he was confronted by rioting farm workers apparently intent on breaking farm machinery. A plough-boy, aged 19, William Cook, hit him on the head with a sledge-hammer. He appeared to an eyewitness to be about to finish off his victim when an estate worker, George Harding, intervened. The full story is set out in the document on the wall to the left of the door leading to the stairs up the tower and at pages 66-69 in ‘A brief History of the Parishes of Swarraton and Northington’ by the Rev. William Eyre. George Harding was rewarded and later established a Trust in his will. William Cook was convicted of Attempted Murder. Despite William Bingham Baring’s appeal for clemency he was hanged the following year. “The path of the just is as a shining light which shineth more and more unto the perfect day”. 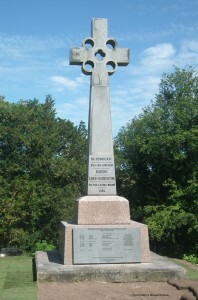 The Ashburton Cross was further dedicated to the memory of all those, from the Parish of Northington, who gave their lives in defence of the realm. This was done, by HM Lord Lieutenant of Hampshire, Mr Nigel Atkinson, on 14th July 2015. The date was chosen because it was the 100th anniversary of the death of Charles Hubert Albury, the first resident of the Parish to die in the First World War. In addition it was the 99th anniversary of the action in which Lance Sergeant Herbert Andrews was awarded the Military Medal. The stone, listing the names of those who died, was commissioned by the 7th Baron Ashburton. There is a ring binder in the Church containing biographical details of those who died in both World Wars together with photographs and details of the re-dedication of the Memorial Cross as a War Memorial.